FiftyAmpFuse is a tribute to the greatest Rock, Funk and Pop music of the last 50 years. With a stellar lineup of musicians recreating every note with stunning detail, the group takes you on an amazing journey through the soundtrack of your life. 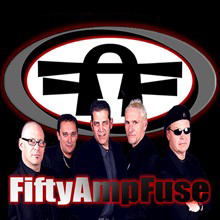 FiftyAmpFuse has performed on some of the largest stages in America from the North American International Auto Show to the deck of the U.S.S. Midway in San Diego and some of the largest concert crowds, from the Hard Rock at Universal Studios Orlando to outdoor fairs and festivals across the country.